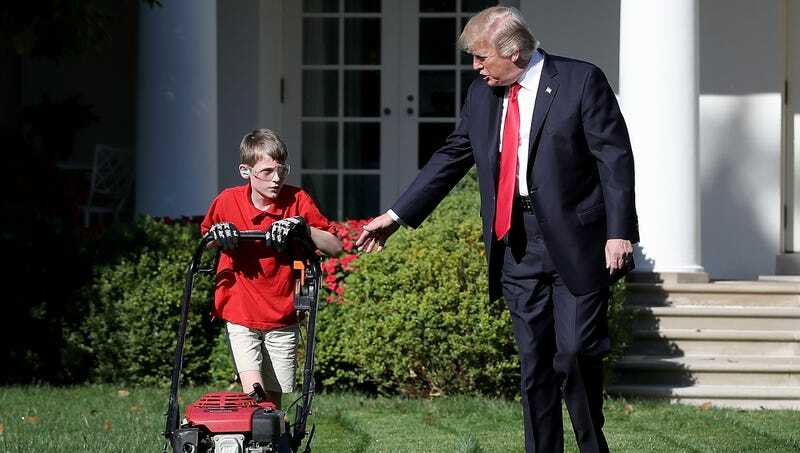 WASHINGTON—Saying the decision represented what was best for himself and for the nation, Frank Giaccio, the 11-year-old boy best known for mowing the White House lawn last September, told reporters Wednesday that he has decided to flip on Trump. “After extensive discussion with my legal representatives, I’ve realized that the right move for me is to cooperate with the special counsel and tell them everything I gleaned about the president while mowing the Rose Garden lawn late last year,” said Giaccio, explaining that as he watered a row of tulips close to an open West Wing window, he overheard the commander in chief reveal potentially incriminating information related to his finances, undisclosed interactions with foreign agents, and his intentions while firing former FBI director James Comey. “The stakes surrounding this case are higher than ever, and it’s time for me to cooperate. Despite my choice, I remain steadfast that neither I nor my lawn-mowing company have done anything wrong.” At press time, sources close to the special counsel stressed that Giaccio had no choice but to cooperate after the FBI raided his house and seized his lawnmower and safety goggles.